While residents of cold-weather climates are shivering indoors by the fire, the lucky folks who visit the Florida Keys are snorkeling, splashing, and fishing in still-temperate waters. The shores of this island chain—with dazzling coral reefs and an abundance of wildlife—are recognized as excellent spots for water play. Blissfully removed from any signs of winter, these eight beach destinations showcase the best of what the Keys have to offer, from diving to kayaking to just plain sunbathing. In John Pennekamp, endless protected miles of the Atlantic Ocean are host to stunning coral reefs and enchanting mangrove swamps. The undersea state park, the first of its kind in the U.S., offers a variety of guided diving options, from certification courses to clinics for underwater photography and fish identification. Divers shouldn't miss the SS Benwood, a World War II shipwreck that sits at a depth of 50 feet, and the Christ of the Abyss statue, in almost 25 feet of water near the Dry Rocks reef. The waters that surround this Civil War-era fort, located on the very tip of Key West, reflect its location: where the calm ripples of the Gulf of Mexico meet Atlantic Ocean waves. This convergence creates rocky offshore formations that are home to a spectacular variety of tropical fish, hard and soft corals, lobsters, and crystal-clear turquoise waters through which snorkelers can view all the underwater activity. Best of all, snorkeling-gear rentals are available right in the park. Located on the Gulf side of Big Pine Key, Calusa Beach is protected from Atlantic Ocean winds, making it a great swimming beach for children. Calusa's shallow blue-green waters and close-by facilities—showers with restrooms, a covered picnic area with grills, and parking—also help boost its popularity. And if the little ones need to get out of the sun for a bit, the park's Sand and Sea Nature Center is within walking distance and offers exhibits on native creatures and habitats. Key West's manmade strand, built with sand brought in from the Bahamas in 1961, offers a rare stretch of white sand among the Keys' otherwise-rocky shores. The convivial vibe of downtown Duval Street extends to this beach, where the people-watching and socializing are just as important as the sun and waves. Beach volleyball and parasailing are also popular activities on Smathers, where the water has a year-round average temperature of 79 degrees. Expect to catch snapper, cobia, wahoo, and much more when you cast a line at Key Colony Beach. Hop on one of the many charter boats that dock in the Key Colony Beach Marina, including Cara Mia Fishing Charters, Best Bet Sportfishing, and The Main Attraction, which offers a no-fish, no-pay guarantee for full-day trips. The islands are known as superb destinations for saltwater angling, so you're almost certain to land something for dinner. There's nothing quite like gliding over glassy water with visibility that extends all the way to the ocean floor, where fish weave in and out of sea-grass beds and stingrays skim the sandy bottom. Curry Hammock State Park is a great place to start a Keys kayak tour, as the park offers rentals, a sandy launch area, and a spectacular trail that rings the island and takes paddlers through a mangrove creek. Make your way to the sandbar just off the shoreline, where the snorkeling is excellent and the shallow water is great for a refreshing mid-tour swim. The beaches of Bahia Honda State Park were named the best in America in 1992 by Dr. Beach—and with more than 2.5 miles of white-sand shores and glistening turquoise waters, it's easy to see why. 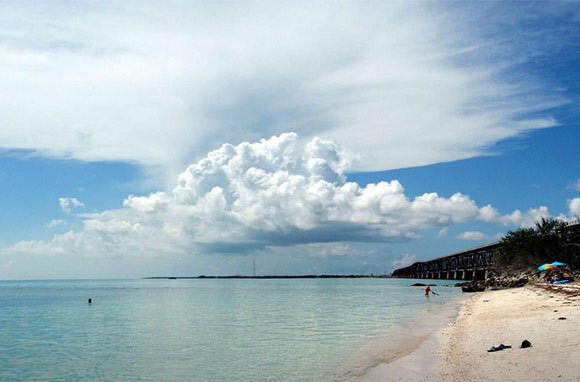 Bahia Honda's quiet, palm-tree-lined strands are havens for travelers seeking pure relaxation. Plop down a beach lounger, pull out a good book, and soak it all in. With campsites that are located literally steps from the Atlantic, Long Key State Park is a beach camper's dream, offering 60 tent and RV sites and full-service facilities that include hot showers, electric hookups, and kayak rentals. Each camping spot overlooks the ocean, which, at high tide, might meander mere feet away from your tent. Wake up with the wildlife—the park is home to egrets, herons, and ibis; loggerhead and green sea turtles; and starfish, to name a few—and take in a private viewing of a vibrant sunrise over the water.